Unlike its name suggests, your meal at Harvest will not be bountiful. After lying in bed for hours watching Netflix, my friends and I came up with the genius idea to treat ourselves to a nice hungover Sunday dinner. We were extremely proud of ourselves for leaving the house and were pumped for some restaurant food. Sadly, Harvest did not deliver and we were pretty disappointed. We ordered the veggie flatbread and the Asian chicken skewers for appetizers and the salmon, quinoa salad and fluke for dinner. The Flatbread: It was OK. We were expecting it to be a lot better especially since they advertise it so much. The crust was floppy and not crispy and it was also served a little chilly. The Chicken Skewers: Good. They give you a solid dipping sauce, but you only get four tiny little pieces of chicken to enjoy it with. The Salmon: Kind of a joke. They literally serve you a hunk of salmon on a piece of burnt wood. Not to mention the two little potatoes and three measly asparagus accompanying it. 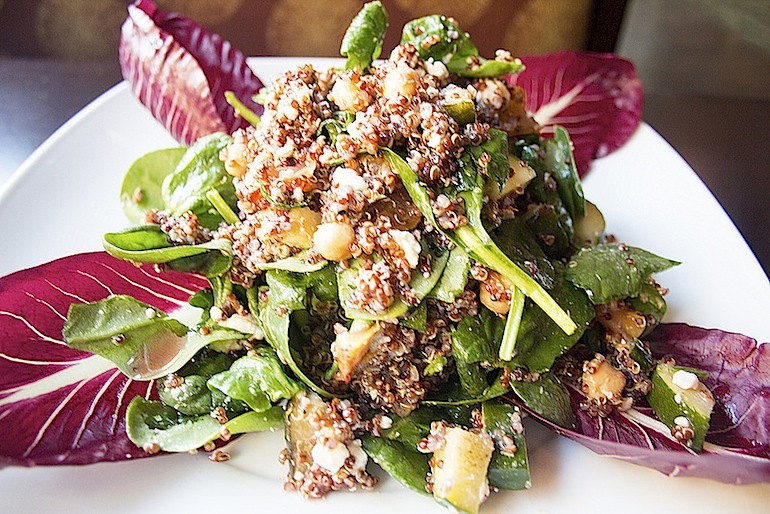 Quinoa Salad: We were taken aback by this dish as the menu is kind of misleading when it comes to the description. We pictured a bowl of quinoa mixed together with veggies and dressing. However, we got a plate of plain spinach and a sprinkle of quinoa on top. I think any of us could have made the same plate in two seconds. The Fluke: The fish was pretty good — I’ll give them that. It was served over a nice portion of white beans and sautéed escarole, which was probably the highlight of our dinner. We left unsatisfied and still hungry after spending serious $$$! Upside is… it’s a great place to kickoff your spring break diet! No need to worry about over-eating here, folks. address: 200 S. 40th St.